Hey kids! This week we have a little something different. An All New Episode of.. This Boring Life, where every episode we will explore The Secret Origin Of IseeRobots one Topic At A Time. The topic for this episode? Bicycles. I love to ride my bike and in this episode I'm gonna talk about my early bike memories as well as my time spent as an adult bike rider! The show starts off with some early memories I had of getting my first bike and all that fun stuff. It's a real fun episode full of sound effects and commercials. VHS Tape! While helping to support the show. Man, we need all the help that we can get. Also hop on over to VirtualDirtmall.com The ISR Superstore and take care of some of your Retro Junk Shopping needs while also supporting The Toys R Us Report. The show starts off with some early food memories like fried bologna sandwiches and pickles and moves onto fast food memories and then ends with some talk about foods that I like now. it's a real fun episode full of sound effects and commercials for places I love to eat at! Hey kids! This week we have a little something different. An All New Episode of.. This Boring Life, where every episode we will explore The Secret Origin Of IseeRobots. One Topic At A Time. The topic for this episode? My early days as a young sprat in the great state of Illinois. On this episode we take a look at my elementary school, Harnew, stores we used to shop at, things I used to do and all sorts of stuff like that. This was really fun for me to record once I started the memories really started to flow. I don't think about Illinois that much but once I did, MAN! The thoughts started coming. I didn't realize how much those early days turned me into the person I am today until I started looking back. Hey kids! This week we have a little something different. An All New Episode of.. This Boring Life, where every episode we will explore The Secret Origin Of IseeRobots. One Topic At A Time. The topic for this episode? Baseball and Baseball Card Collecting. This episode may come across a bit disjointed. I actually started it back in Oct of 2017 but then the big fire started so I sort of fell of sced and was finally able to finish it up. It's a ton of fun though. Don't worry. We cover a ton of Baseball Video Games that I played, Baseball Stars, Earl Weaver Baseball and others before moving onto my passion for Baseball Cards. There is talk of shops, shows and popular cards of the time. Don't worry man, if you don't like baseball it's all good. It's mostly about video games and card collecting. It's a super fun episode! Give it a listen and make sure to tell a friend! The topic for this episode? My 7th and 8th grade best friend a kid named Andy. He was wild man, dude was just a total lunatic. On this episode we talk about RPG's, Destroying light bulbs, Home Invasions, WWF Figures and all sorts of other weird stuff. It's a lot of fun. The topic for this episode? Gym Class, that hour long workout we had to go through everyday of our school life. We're gonna start off with Grade School and move all the way through Jr.High. We're gonna look at the sports we played, games we played, the locker-room, the teachers and all that good/bad stuff. There are a ton of personal stories as well as a gang of new little songs. It's a super fun episode! Give it a listen and make sure to tell a friend! The topic for this episode? Lost Places or, Places that I used to go to all the time that for whatever reason are now gone. It's a real fun but also sort of sad episode. I got super bummed talking about these 5 place that were super important to me, a restaurant that my family used to go to, a water-park, a magazine store and a couple other places like that, i think my bumming shows but don't worry. I still had fun and I think that you will too. There are some old commercials and one of them in particular has been in my head for a week straight now! I can't stop singing it! Still though, it's an interesting piece of history especially for a Sonoma County resident but even if you aren't just hearing about this stuff is sure to make you remember some places that you used to love going to. Give it a listen and make sure to tell a friend! This Boring Life Ep.4: Comic Book Stores. The topic for this episode? Comic Stores. Yep, this is the one where I go in-depth into my comic book collecting history. It's super fun and also Super Informative. Over the course of the show we take a look at all of the comic shops here in lovely Santa Rosa California and the surrounding areas. There are stories about Mr. T, this is one of my best stories so make sure to give it a listen. There are tales of my early days in SR as well as a story about the time I met comic book legend, Jim lee. It's a super fun episode and at just over 2 hours long is the longest episode of anything that I have recorded to date. I don't know if that is good or bad. This Boring Life Ep.3: Bowling. My Life On The Lanes. The topic for this episode? Bowling! I am a super bowling maniac. I love the game and everything connected to it. I spent many a year hanging and banging around Bowling Alleys and on this episode I will tell you all about it. We start with some stories of my youth hanging out at Holiday Bowl and then we move into my time in a Bowling League and some info about my team, The Cash Money Millionaires. There are video game stories, pinball tales and all sorts of great stuff. You do not want to miss this! It's a great show like always, Make sure to tell a friend and make sure to stop by SupportTheReport.com and check out how you can get the ISR Supertape VHS Tape! It's totally worth it! Just do it already! 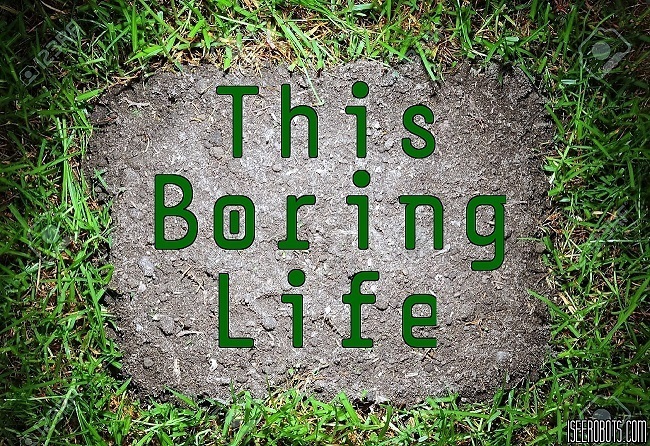 This Boring Life Ep.2: Q-Zar Days. My Time As A Laser-Tag Arena Marshall. Hey kids! This week we have a little something different. An All New Show.. This Boring Life, where every episode we will explore The Secret Origin Of IseeRobots. One Topic At A Time. The topic for this episode? Laser-Tag! I spent a year or thereabouts as a Marshall for a local Laser-Tag chain known as Q-Zar and in this episode I tell you all about it. This right here is a super fun episode! There are celebrity run-ins, laser-tag duels with comic book legends and all sorts of off-beat shenanigans. It's super fun.